DVD Synopsis: A deep-sea earthquake occurs creating a tidal wave that is headed straight for Haeundae, a popular vacation spot on the south coast of Korea, which draws visitors from all over the world. During its peak season, more than a million vacationers pack onto its narrow one-mile strip of sand. While tracking offshore seismic activity, Professor Kim, a marine geologist, recognizes the impending danger of a mega tsunami. He desperately attempts to warn authorities and alert the unknowing vacationers of the 500 MPH destructive force of nature headed their direction. 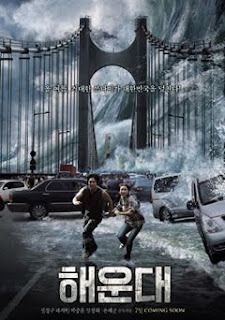 Tidal Wave is a disaster movie that spends most of its running time building up to the tragedy, filling it's first 2/3's not with chaos and CGI, but character development. In fact, following a dramatic pre-title rescue at sea (which occurs on Dec. 26, 2004, the same day a real Tsunami crashed into Southeast Asia, killing hundreds of thousands of people), the film slips into comedy mode for a while, with plenty of insults, pratfalls and general mayhem, before settling down into more melodramatic territory. Far from growing impatient with Tidal Wave, I realized, once the action took hold, that the time dedicated to exploring the various back stories was time well spent; I found myself caring about these characters, and when the wall of water finally did arrive (an event that’s simultaneously spectacular and horrifying), there was an added layer to the tragedy because of how invested I'd become in these characters. Did the payoff justify all the time spent building up to it? Well, it certainly did for me. Yeah, if you like your disaster films populated by well-rounded characters, the TIDAL WAVE is for you. The film really explores this small community in detail, and when the water does arrive, it's pretty awesome. I'm glad you followed the RT as well. Thanks again!